Narwhals and dragons, and unicorns, oh my! Fantastic creatures that have graced the pages of fairy tales and roared to life on the big screen are coming to life like never before this year -- in your kids' toy boxes. 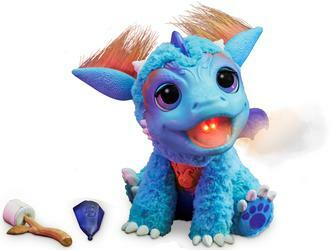 You would think a fire-breathing dragon probably wouldn't make a great pet--but Hasbro is changing that. Joining its Furreal Friends line this fall, Torch My Blazin' Dragon Pet (pictured below) is an interactive baby dragon full of personality. This spunky little guy features ultra soft neon fur and a crop of firey orange hair, along with a glimmering pair of sparkly purple eyes. But Torch--just like lots of other toys that will be on display next week at the North American International Toy Fair--does more than just look incredible. "Watch me" toys that simply sing, move, or perform for kids are not enough anymore. Instead, kids are eager for toys that respond to them in real time and have innovative new features that keep them engaged for hours. These toys allow their imaginations to run wild, bringing the fictional creatures from their dreams to life before their very eyes. Kids can watch as Torch breathes flame-colored mist through his mouth, which can even "toast" his included marshmallow treat. Once the marshmallow is nice and toasty, kids can feed it to Torch when he's hungry to hear some happy chomping sounds. With more than 50 different sound and motion combinations and poseable arms, Torch will respond to kids in different ways when they pet him or cuddle him close. Best of all? He doesn't require any training. With dozens of interactive pets on the market, the fun doesn't stop at cats, dogs and birds anymore. Toy companies are expanding their lines to include incredible creatures that broaden kids' worlds into magical realms of imagination. The interactivity of toys like Torch allow kids to think outside the box, providing a great fusion of tech with classic, make-believe play. Princesses, fairies, dinosaurs and dragons help inspire kids to think creatively, and remind them that anything is possible.